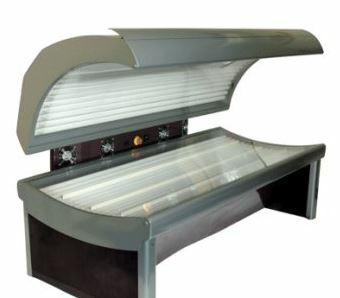 The owner of a salon offering sunbed treatments in Wales has been fined under the Sunbed (Regulation) Act 2012 (Wales). He is the first person to be prosecuted under this legislation, which came into force in Wales in October 2011. David Kirkham pleaded guilty to failing to ensure staff as his Malibu Sun shop in Flint had sufficient training, experience or knowledge to enable them to fulfil the requirements of the act. He also failed to display a prominent poster with prescribed health information on it and failed to provide protective eyewear to clients. The prosecution said that clients of Kirkham’s salon were able to walk in and use the sunbeds without any consultation or advice, and that the beds were not cleaned or cooled properly between uses. The legislation in Wales is more stringent than in England, where it is an offence to allow clients under the age of 18 to use a sunbed. Back in January, Stewart Hall became the first to fall foul of the regulations in England, when a 15-year-old girl used a token-operated sunbed in his Olympic Power Mill gym in Bury and suffered severe burns. The girl was not asked for proof of age or given any protective eyewear. She used the sunbed two days in a row, resulting in such severe burns she was hospitalised for 24 hours and missed three weeks of school. Mr Hall was fined £2,000. Kirkham, who was fined a total of £3,700, claimed in his defence that while he had ensured his salons operated within the stipulations of the legislation in England, he not appreciated the tighter regulations in Wales. Salon owners in Wales are obliged to clearly display prescribed health information to users, and are prohibited from displaying material relating to the health effects of using sunbeds.